Luke Stahmer has undergrad degrees from CU Boulder in finance and astrophysics with an MBA from CU Denver. He started his career as an intern working for John Elway and worked to be senior vice president Elway’s championship Arena Football Team the Colorado Crush. Stahmer co-founded the Dare to Play sports camps with another Broncos legend, Ed McCaffrey. The camps pair kids with Down syndrome with pro and collegiate athletes for several days culminating in a scrimmage. During the last 10 years, the camps have made a huge impact on well over 1000 kids while being featured on ESPN and other national media. Stahmer has served on the Arc Board since 2005 where he’s chaired two of five executive committees for the company and been part of tripling revenues from $30 million to over $90 million in 2018. Today, Stahmer primarily works in venture capital where he has been part of funding and strategic development for 8 early stage and rapid growth companies. The Recycled for Sight donation box locations map is back and running of the website. We know there is heaving usage as we were receiving 1-2 calls or emails a day telling us the map was not functioning and wanting a location. Denver Lions service over a 100 boxes. Click here to check out. Service Tuesday was a big success. 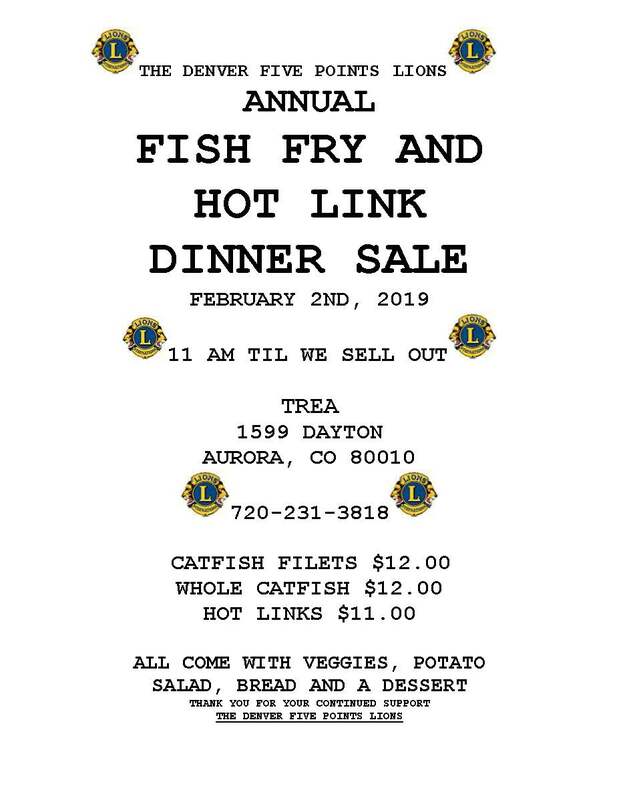 This event was to support the upcoming Denver Lions Mission trip to Ethiopia. 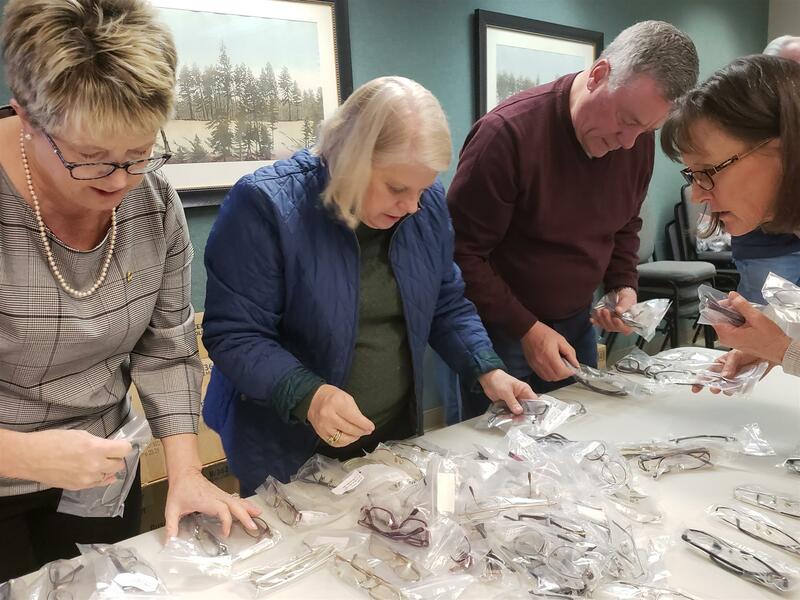 The team sorted and packed 4200 Recycled for Sight glasses. 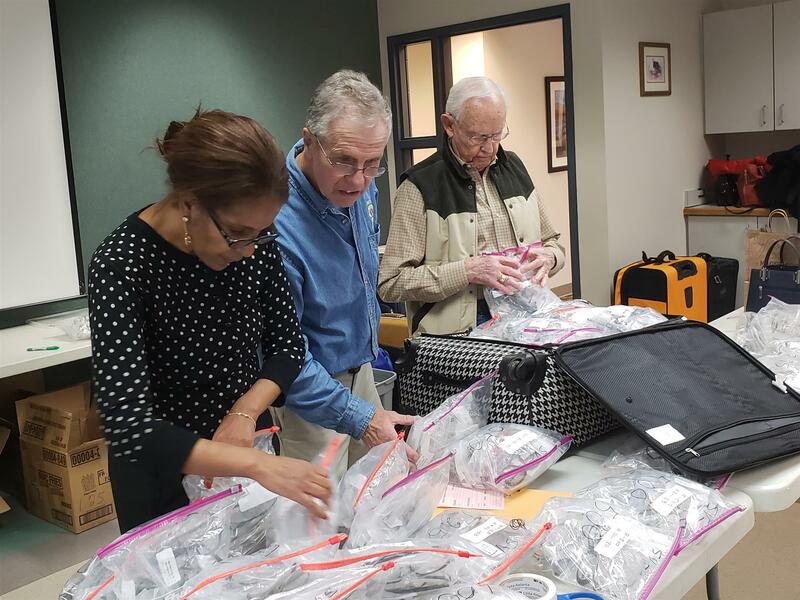 These are glasses the Denver Lions collects and then processed by the Sterling Lions. The next stop for these glasses is Ethiopia. 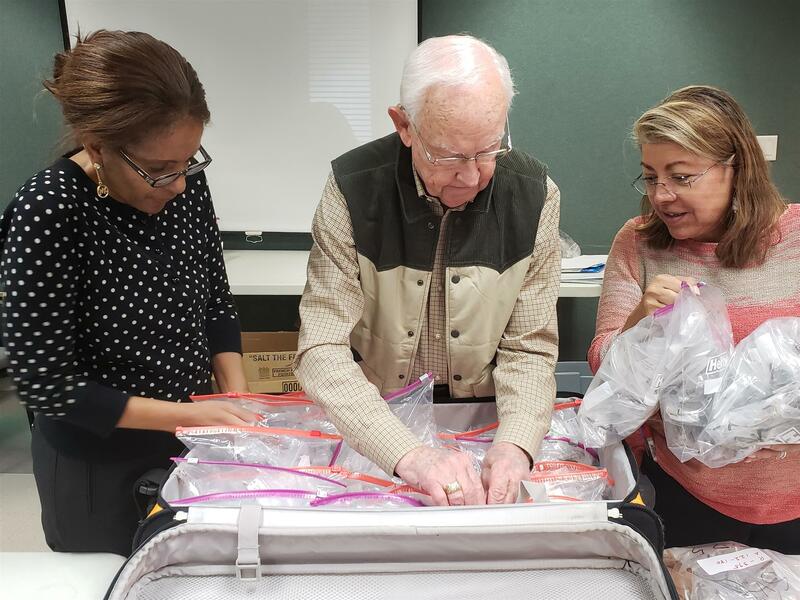 Also finalize the packing of 100 school supply bags also going to Ethiopia. Thanks to 22 Lions and guests helping to sort and pack. Thanks, Lions Dan, Myrna, Ned, Bill, Fletcher, Ruzz, Shuck, Steve K, Susy, and Steve K.
Lion Lawrence Ray “Larry” Weygand (78), passed away on January 4, 2019 at Porter Hospital with his family by his side. Born January 5, 1940, in South Haven, Michigan, Larry grew up in Benton Harbor Michigan. He graduated from Benton Harbor High School. Larry attended the University of Michigan – Ann Arbor and Drake University, graduating from Drake with a BA in Political Science. Although he intended to obtain a law degree, he ultimately entered the insurance business. In 1966, Larry moved to Denver, Colorado, where he has called home since. He was president and owner of Weygand and Co, an insurance firm and later founded New Millennium Vacations, a guided tour company. Larry enjoyed a life of travel and culture and always enjoyed researching what was new in Denver, Colorado, and around the world. Most recently, he and his wife Paula ran a travel website, Savvy Travel Decisions, compiling information and pictures for well-known tourist attractions and places locals usually go. Larry was also a well-respected active member of the Lions Club of Denver. For many years Larry arranged for meeting speakers. Lion Larry was a Denver Lions Director and a Denver Lions Foundation Trustee. Lion Larry was awarded Lion of the Year in 2009. Larry grew up a fan of the Chicago White Sox, but became an avid Rockies fan and loved the sport of baseball. He had a wealth of knowledge across many areas and loved to learn about and explore his adopted home of Colorado. A memorial service will be held on Friday, January 25, 2019 at 2pm at the Chapel of Horan and McConaty Funeral Home, 11150 East Dartmouth Avenue (At S Parker Rd), Aurora, CO 80014. With a seventy to eighty percent unemployment rate for adults who are blind and visually impaired, we should all be alarmed. When the national unemployment rate hits ten percent our nation is in an uproar. Colorado is fortunate to have The Blind Institute of Technology (BIT) a 510c3 nonprofit, founded by Mike Hess. Mike had a successful career in the corporate world, but was frustrated when friends shared their struggles of getting a job. His friends were highly educated and had the skills, but employers would not give them an interview, much less a position in their company. Mike decided to put his own career on the line and founded BIT. BIT connects employees to employers who are looking for hard workers that are qualified and have the hunger for a successful career. 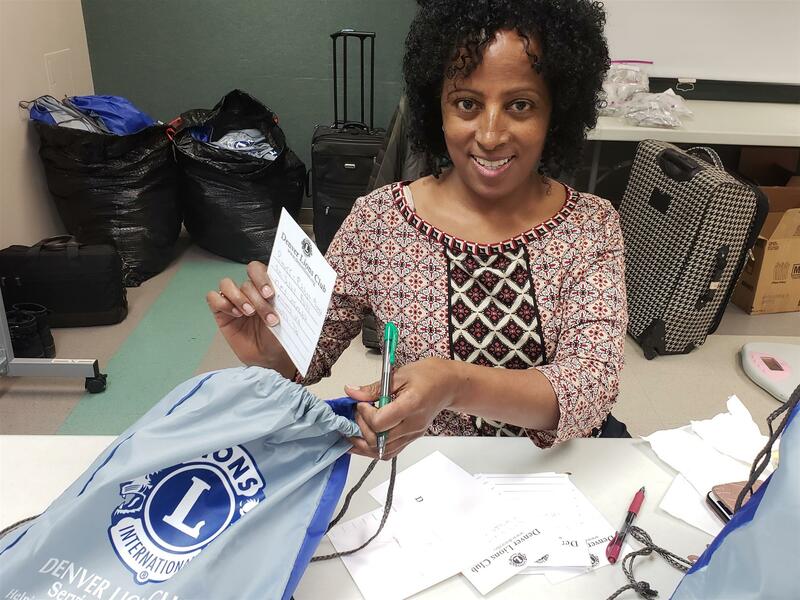 BIT offers services and assistance to job seekers with disabilities, and their potential employers that reduce barriers to inclusive employment through education, preparation, opportunity and accessible technology initiatives. How can Lions help? Lions can learn more about BIT and if you or someone you know is looking for workers, connect them with BIT. Go to https://blindinstituteoftechnology.org to learn how, as Lions, we can be part of the solution. We were excited to have Kim Day, CEO of DIA. She gave us the success of DIA since opening and what the future holds. 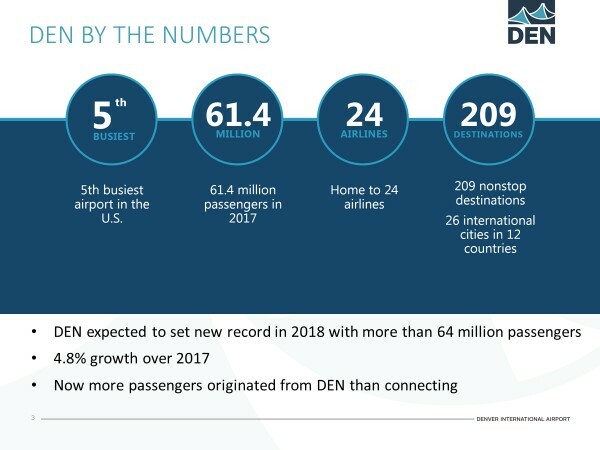 We also should be excited about DIA, our home town airport.